Humanscale L6 Notebook Manager dramatically improves user comfort and reduces the risk of long-term injury by promoting good ergonomic posture while using a laptop computer. Offering a number of practical features, the versatile L6 is ideal for full-time workstations, home offices, hospitality applications, and any other workspace in which a laptop computer is regularly used. The versatile L6 offers a number of practical features: Cable management, heat ventilation, security features, and an optional removable USB hub. Humanscale created the L6 notebook manager to discourage users working in poor postures, such as "laptop hunch". Working in conjunction with an external keyboard or keyboard system, the L6 secures the laptop in place, with the screen positioned at a comfortable height, ensuring the best (and most ergonomic) way to work on a laptop. Total Convenience - At a lightweight 8.4lbs, the L6 can be used anywhere you would set up a laptop. An optional USB hub can be built in to create the most accessible application. 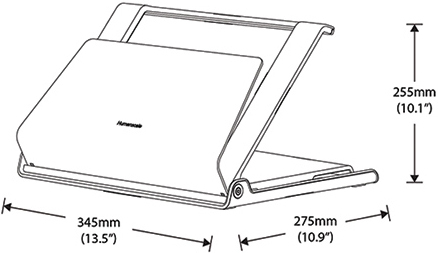 Personal Adjustability - The innovative clutch hinge allows the user to effortlessly adjust their laptop’s display to the height convenient for them. Innovative Swivel Base - The L6 features a one-touch 360-degree swivel base for efficient collaboration and screen sharing. Design Story - As the need for flexible desks and shared workspaces grows, Humanscale’s team wanted to create a solution that would allow open, co-working design without sacrificing personal comfort for users. The L6 notebook holder gives workers the freedom and individual adjustability to promote health and productivity in any kind of environment.